Today: Sometimes it’s okay to be immature. 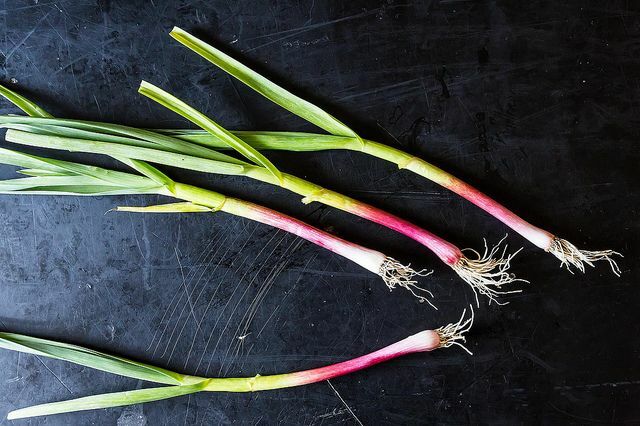 In the case of green garlic, it’s more than okay -- it’s a highlight of spring. Green garlic (also called young garlic or spring garlic) is simply garlic that hasn’t fully matured. It's the natural result of farmers thinning their garlic stock, but an increase in popularity has turned green garlic into a crop in its own right. 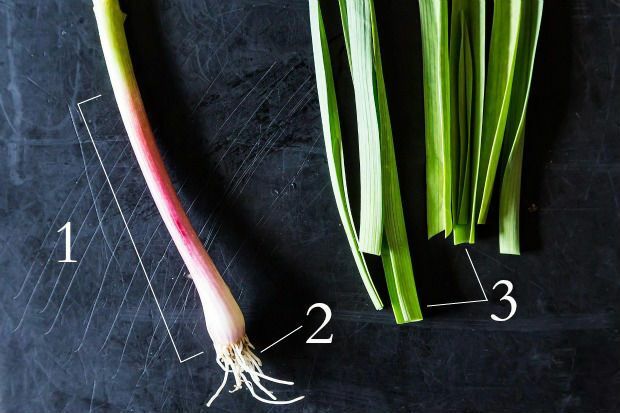 Green garlic is pulled from the ground before the clove and bulb skins dry out, so you might see green garlic at various stages of growth: with a barely discernible bulb (like a green onion), with a small bulb, but no clove separation (like a spring onion), or with a large bulb and cloves. Some garlic enthusiasts might tell you that the final form is true green garlic, and the earlier varieties are actually garlic scallions -- but we aren't linguistics sticklers. Either way is delicious. More: Can’t get enough garlic? Keep an eye out at the market for garlic scapes this summer. Green garlic often looks so similar to green onions and spring onions that you’ll have to do a double-take. The best way to be sure you’re getting green garlic is to take a whiff -- it should smell pleasantly of garlic rather than onion. You'll also notice that leaves are flat (3) rather than tubular. Pick the bunches with long white or purple bases (1), dark green leaves, and intact roots (2). Avoid plants with any bruising or wilting, and those with an off-putting pungent odor. Green garlic should be stored in the refrigerator, where it will keep for 5-7 days. Wrap the green garlic in a damp paper towel and place it in a plastic bag; or for a non-plastic alternative, stick the green garlic in a tall glass with some water in the bottom. 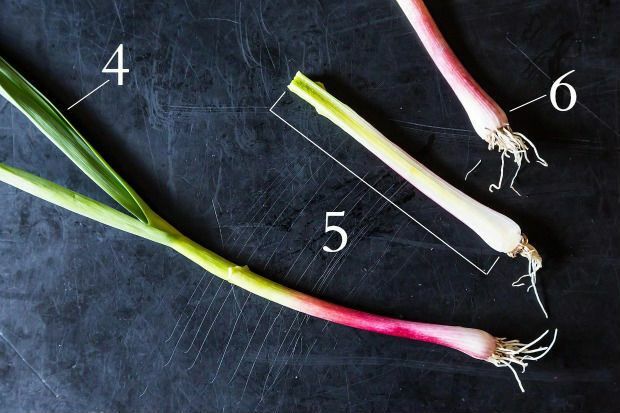 To prep, treat it like a small leek: trim off the very bottom (6) of the bulb (the roots are actually edible too, once the basal plate -- the part that holds the roots to the plant -- is removed), and use all of the tender white and light green parts (5). Dark green leaves (4) can be saved for stock, or used to add flavor to a soup (pop them in whole, like a bay leaf). Aside from maybe your peanut butter sandwiches, green garlic can be used almost anywhere! Use it wherever you’d use regular bulb garlic or green onions, or use it in recipes specifically designed to highlight its unique mild garlic flavor. Add raw green garlic to salads, dressings, and sauces. Try it braised, grilled, or pickled. Add it to a frittata, a soup, or pair it with other spring treats like asparagus. Put green garlic in pasta, a rice bowl (don’t forget to pick up pea shoots), or a confit. Are you picking up on the versatility here? They even grace the cover of this lovely book. I developed a hydroponic method to grow green garlic in Houston and was selling it in several super markets all year. It's wonderful produce but consumer awareness is negligible so hard to sell required quantity to survive. The picture in this article is later stage of green garlic. After planting you should harvest green garlic when the chives are around 12 to 15 inches tall. At this stage the clove will still be intact and taste of chives will be heavenly garlic(fanatic green garlic lover). It's two in one garlic - cloves with stronger taste can be used in cooking and chives for delicate garlic taste. If you want to grow green garlic plant cloves individually about one inch apart in cooler temperature ( spring and fall) - put in soil enough to hide top of garlic. Water daily and in less than three weeks green garlic will be ready to harvest. I've read that fall is really the time to plant garlic, but that some plant in spring ... but no info on when to harvest summer-planted cloves. If I plant garlic now, will I be able to harvest green garlic in the fall as I'm planting more at the prescribed time? Hi tbeth11 - I asked my favorite local garlic farmer, Diana Dyer, and her response was, "Yes you can put garlic in the ground anytime and harvest green garlic anytime. I have heard that Alice Waters does planned sequential garlic planing (of course her climate is helpful) so she has a continuous crop of green garlic for use all year long. Putting garlic in the ground now will become whole garlic bulbs by fall, but smaller in size, so green garlic would need to be harvested much sooner than coming fall. So much of garlic maturation is daylight dependent, too, not just time in the ground." Good luck with your garlic crop! Oh, thank you! This is wonderful news. I suspect we'll have our first round in the ground today, and love the idea of sequential plantings for green harvest throughout our growing season. Green garlic puts "regular garlic" to shame in my opinion! I've got two beds of garlic this year in the garden and I set aside a some plants to pull early for green garlic - this week should be the week so your post is very timely for recipe ideas, thank you! A vendor at our farmers market has green garlic. I like using it in egg scrambles and okonomiyaki. Absolutely Delicious! Ooh yes, okonomiyaki is brilliant! Adding that to my meal plan this week.